This beautiful 17" square tulle has scalloped edges. 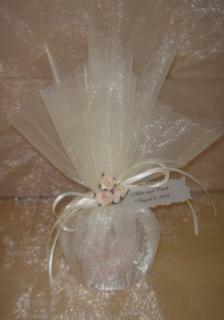 It is perfect for wrapping larger favors, such as candles. Available in packages of 50. 17" Square Silk Type Krystal Squares with scalloped edges. Available in ivory. Comes in packages of 50.